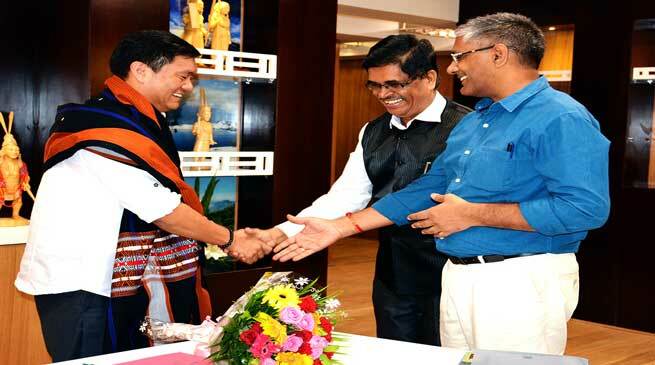 Chief Minister Pema Khandu in a meeting with the S. Sankaranarayanan , General Manager NABARD, emphasized on creating more self-sustainable activities for the unemployed youths of the state. Such self-sustainable activities would provide an alternative employment to the growing unemployed youths in the state, he said. While lauding the assistance of NABARD in funding various Rural Infrastructure Development Projects under RIDF in the state, CM asked GM, NABARD to increase their outreach and to establish more offices in the districts. He asserted that people are unaware of many beneficial schemes provided by NABARD for the rural masses. He asked them to create awareness among the rural people about the spectrum of activities under Agriculture and allied sectors like Animal Husbandry and Rural Development, etc offered by NABARD. He further stated though in the past rural connectivity dominated the sanctions; the state would prioritise and submit projects in agriculture/rural development and social sector during the current year.